When in doubt, just name the post after your preggo week. So, what’s going on? Sleeping has been a bit easier. The restless leg comes and goes, and I’ve gotten a bit more used to it, so it’s not as troubling. I think the freak out factor of having it (What if it never goes away?! What if I never sleep again?!) is worse than the actual sensation. Now, if I have it but I’m ready to sleep, I just listen to a Podcast, which distracts me from my jumpy legs and off to dreamland I go. 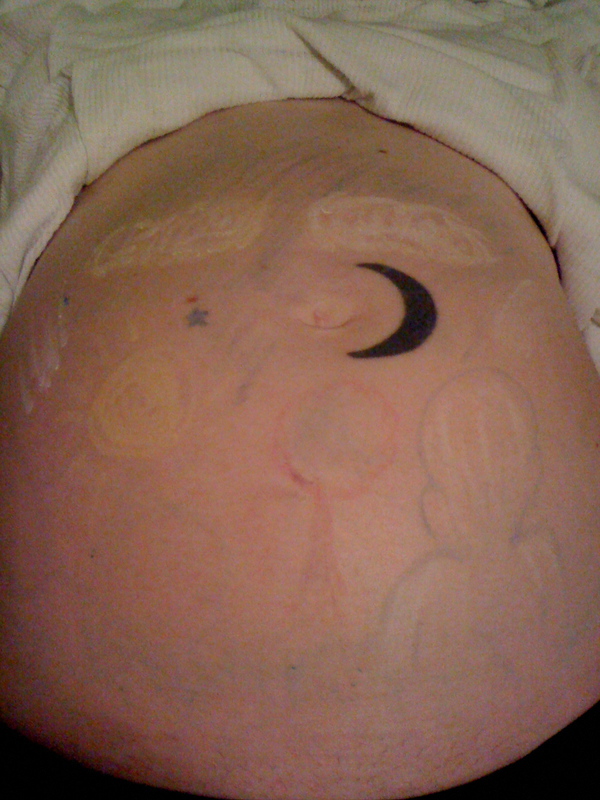 Husband drew on my belly. See Ian on the bottom right quadrant? Pretty cute. I’ve found my appetite to be more sensitive, a la first trimester a bit (like, all of a sudden, I’m nauseous or starving, or both) and I’ve gotten scolded more than once for not carrying food in my bag (bad mama). We’re starting our birthing classes tonight. Exciting! I’m finding myself becoming less afraid of birth and yes, at moments, even looking forward to the adventure I’m sure it will be. Lastly, I think I’ve started to have Braxton-Hicks in the last couple days. No pain at all, just a tight feeling in my uterus, which goes away in 10-15 seconds. Because I have never done this before, it makes me a wee bit concerned about flying, but I will confer with my birthing teachers tonight about that. We found a pediatrician! She is taking new patients, takes our insurance, is walking distance from our house (BONUS! ), and was personally referred by two friends who have babies. I cannot tell you how relieved I am that this detail is in place. Navigating health care is just about my least favorite thing to do, and of course I want only the best for little Ian Bein’. Okay, I’m off to roast a chicken, some yams and steam up some broccoli for dinner before class. I’m gonna destroy that chicken!